Have you always wanted to do more with your beach house? Well, who wouldn’t! A beach house is the perfect opportunity to have you own private vacation. Well, here are some ideas for beach house designs that should make your days more interesting. From beach house bedroom decorating ideas to kitchens, we have tried to cover all. Let’s take a look, shall we! 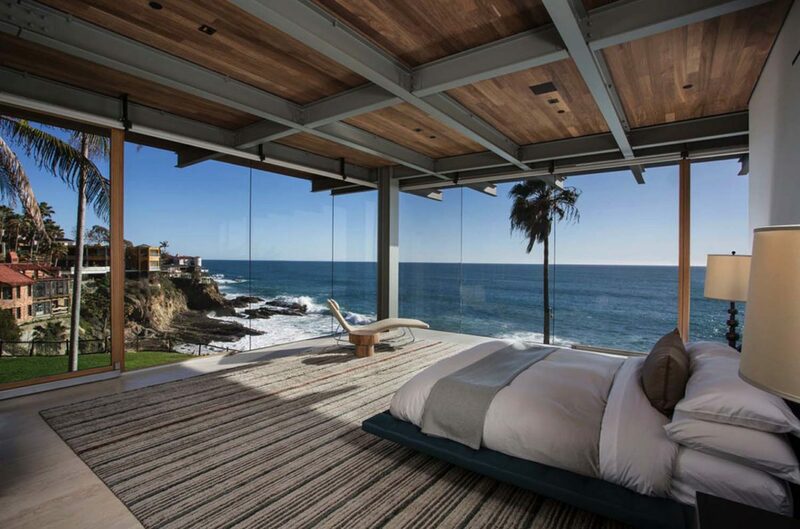 The beach house provides the perfect view one would like to wake up to and sleep with. The roaring sound of the waves and the exotic silence at night makes a beach house an amazing opportunity for people of all ages. The design highlights here are wide windows that provide the maximum view of the outdoors. Unless you are seeing the sea enough, you design isn’t good enough! The cozier a bedroom, the better it always is! Well, the implications rise when we are taking of a beach house master bedroom. In the case, you will have to use a lot of glass to connect to the outdoors and yet keep the settings charming and private using unique décor and furniture. Beach house furniture always needs to be exotic, like you are living a vacation for a life! 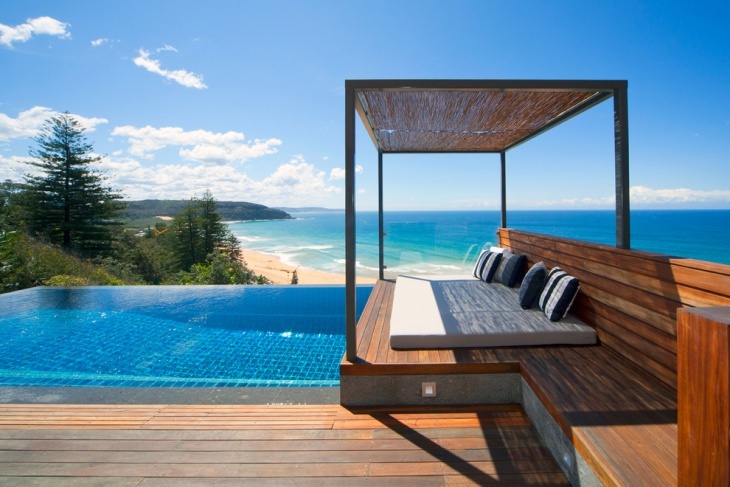 The bed in particular needs to be well spread and placed in straight view of the beach ahead. 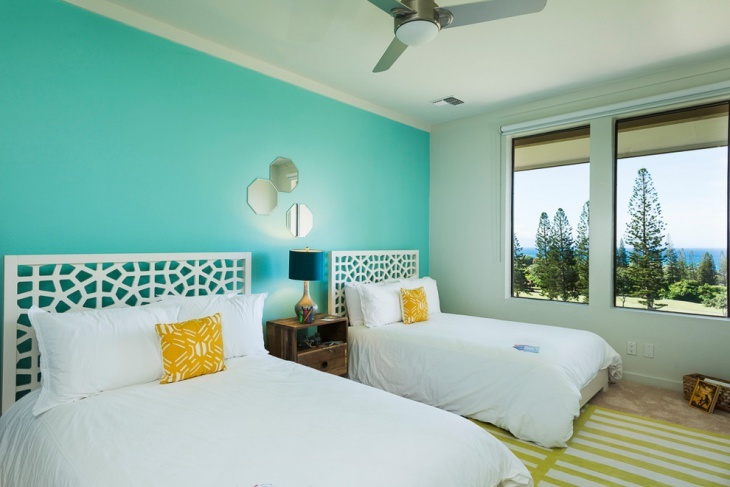 A tropical beach house bedroom theme is marked by the use of quaint furniture and a layout that evokes a sense of sensuality. The use of natural lighting also plays a big role in making the space look charming. 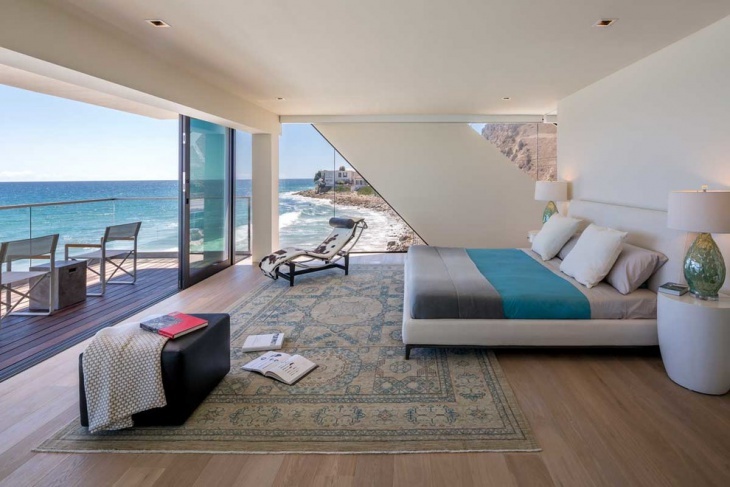 Space is never an issue with a beach house bedroom. All you need is a comfortable bed, a TV and a design theme that evokes a sense of peace and tranquility. A beach house is best themed in white. 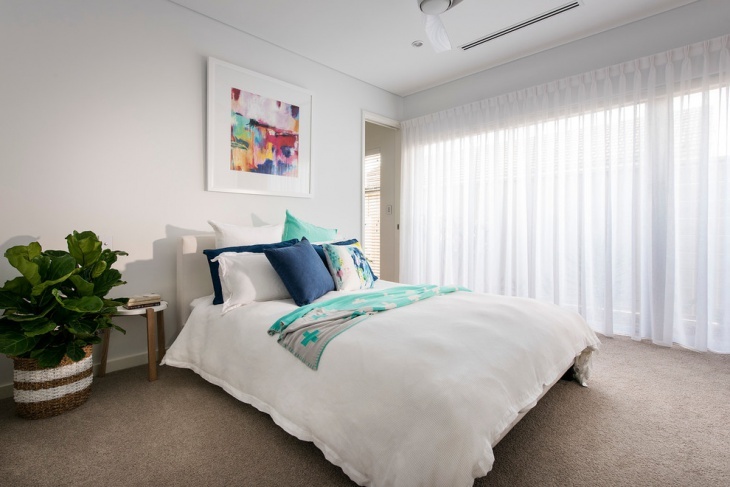 As shown beautifully in this example, the room is marked by big white curtains, a big comfy looking white bed and a lighter colored wall. Small contrasting items like the plant tub can bring in the necessary balance into the room. The choice of floor for your beach house depends on the type of construction you want to go for. Wooden floorboards look exotic but will need heavy maintenance as there is a lot of moisture in the air. Tiling is an alternative and is available in a lot of textures, even representing wood grains and other natural hues. This is an awesome way to construct a beach house bedroom. Completely open to the beach, its glass that gives the residence privacy from the outdoors (glazed glass that is opaque from the outside). With wooden floorboards and ceiling, life could be forever romantic! 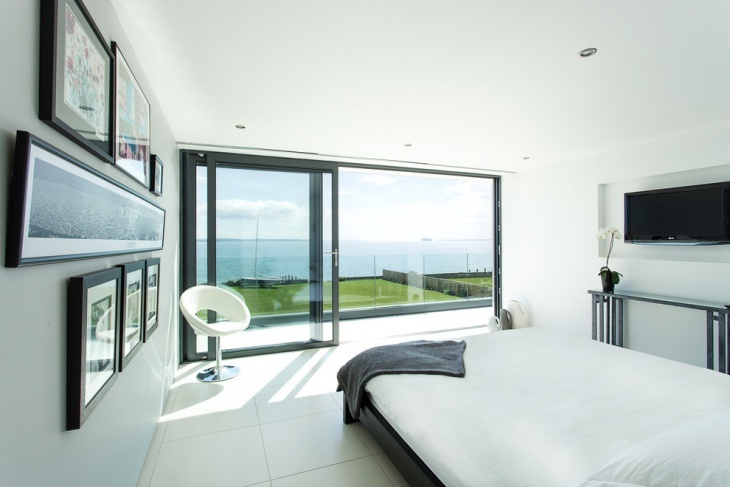 You can choose to create more private quarter for your bedroom that gives small view of the beach ahead. The use of glass and a lighter colored theme makes the ambiance look awesome. 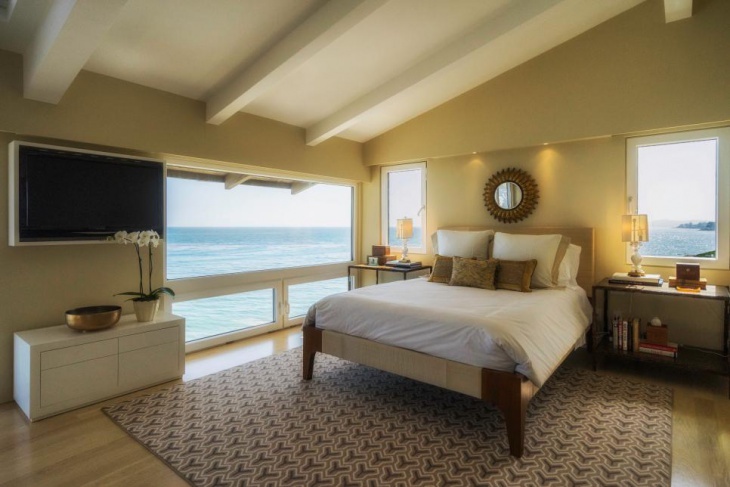 We hope that you loved our master bedroom ideas for your beach house. if you have something unique at your end, we would be glad if you can share it with us.